Lots of influencers, would-be influencers, and aspiring thought leaders want to become contributors to Forbes, Inc., Entrepreneur, and other major publications, and why shouldn’t they? The benefits of writing for these publications isn’t getting paid (most contributors aren’t paid), it’s getting exposure. How much can that exposure be worth? In my own case the 300+ articles I’ve written over the past three years have generated millions of dollars in revenue for my marketing agency, led to a book deal, and landed me paid speaking engagements. I have to laugh when anyone approaches me and says “Forbes reached out to me and wants me to write once a week for them, but I’m really busy, do you think it’s worth it?” Heck yeah it’s worth it! I got connected with Forbes through luck. I knew the right person at the right time, and the opportunity fell into my lap. That’s not going to happen to most of you so you’re going to have to pitch the publication you want to get into. When you pitch them, don’t make these mistakes. If I were hiring an artist I would want to see his other paintings. If I were hiring an architect I’d want to see houses she had designed. If I’m hiring a writer (even an unpaid one) I want to see what they’ve written. Not only that, I want to see how they promote their writing and get it out there. 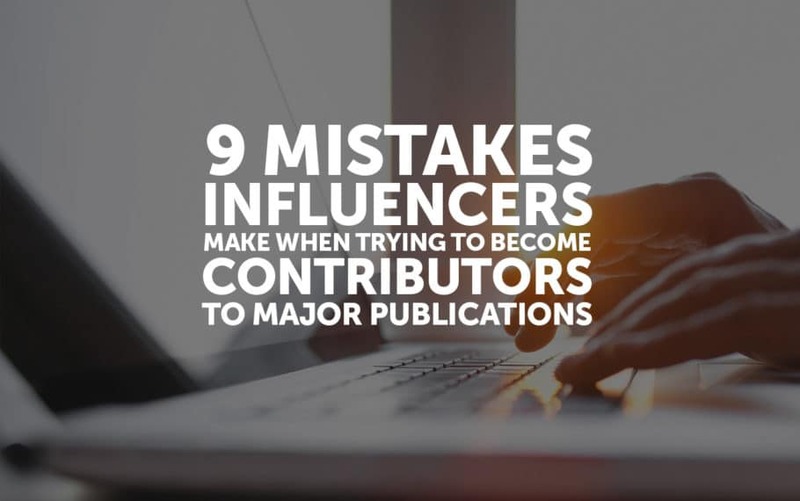 If you want to be a contributor you better have examples of prior work you can show, and not in a Word doc, but on your own blog, someone else’s blog, another publication, LinkedIn Pulse, Medium–somewhere out there where it’s getting real traffic and comments. Different publications cover different topics, and each has its unique focus and flavor. Forbes is not TechCrunch is not Mashable is not Fast Company is not the New York Times. Make sure your writing fits the publication you’re pitching. How can you know if you’re writing is a fit? I’ve found that reading the publication you’re pitching helps. If you want to write for the entrepreneurship section at Forbes don’t pitch the editor for the marketing section. Do your research. Make sure the editor you’re pitching in fact is the editor for the section you want to write for, and that this editor is the one who makes the decisions about bringing on contributors. Contributors generally aren’t in a position to help you get on as a contributor. The exception is if you know the contributor well. If you are not a close friend or buddy of a contributor, please, please, please do not reach out and say “Hi! I love your writing, can you introduce me to your editor?” This puts the contributor in a very awkward position. He wants to be nice to you, but if he helped everyone who asked him this favor he would be doing 20 such favors every month, his editor would get annoyed and fire him, and then he wouldn’t be of any help to anyone. Contributors have a very limited number of introduction-favors they can hand out, so they’re going to hand them out to their friends–not strangers. And that would be the end of that road for you. You could do this 200 times and the results will be the same every time. Instead of asking contributors you don’t know to make introductions for you, ask them for advice on how they got signed up as contributors so you can learn from them and figure out the right formula. It’s the wrong strategy to pitch contributors, but even worse is to pitch contributors, writer, or editors who no longer write for the publication you want to pitch, or staff at a publication who don’t work with contributors, like an art director or head of HR–just because someone works at Forbes doesn’t mean they can get you signed on as a contributor, or that they even know who to talk to. Find out who makes decisions about bringing on new contributors and what the process is. Some publications, like Inc., have a standard procedure you have to follow unless you have a personal connection. Don’t try to work outside the process unless you know what you’re doing. Everyone makes a mistake now and then, but I get pitches from people that are riddled with basic spelling errors, incorrect grammar, awkward sentence structure, and strange phrases. I’m especially talking to all of you in India–yes, you write and speak English, but it’s different English than what is spoken and written in the US, and if you’re pitching an American editor at a US publication then you better do it in her language. If anyone thinks I’m stereotyping of course I am, but it’s based on thousands of emails I’ve received, and my intent isn’t to put anyone down but to help those who need help the most. Read your pitch before you send it. Use spellcheck. Use Grammarly. Have someone else read your writing, preferably someone who speaks the same language as the person you’re pitching. Just don’t do it. It doesn’t work. Sell, sell, sell. Figure out what they want, and build up your value so much they beg you to write for them. Respect the time of the person whose favor you’re seeking. Be sensitive to when is the appropriate time to ask for the favor of more time. Go read Jab, Jab, Jab, Right Hook by Gary Vaynerchuk or Give and Take by Adam Grant–if you are always seeking value from others but never returning it, or you give a little value but then ask a lot in return, or you give things people don’t want and think you’re giving them huge value, or you are insensitive and lack tact when you ask for value from others even when you’ve given a lot, then you’re going to rub a lot of people the wrong way and you won’t get much value from them. A lot of potential contributors talk about themselves in a pitch and go on and on about how much value they would get if they could get signed up, rather than talking about the value the editor/publication would get. Give before you get. Help those who can help you, and help them before you do anything to try to get them to help you. This leads into my top tip on how to become a contributor–give so much value people can’t help but notice you. The best way to become a contributor isn’t to pitch anyone, it’s to become an influencer using the tools you already have and provide so much value to others that Forbes, Inc, and the others come and beat down your door to ask you to write for them. If you can’t do that on Medium or LinkedIn Pulse what proof do you have to show them you can do it on their platform? Build your own platform, give value, then the opportunities to build your platform faster by collaborating with other platform providers will come naturally. Are you a contributor? What other “don’t do this” tips would you give to aspiring contributors?